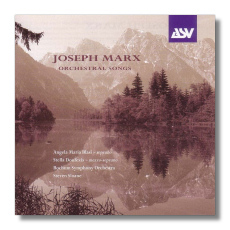 This is the second disc in a series devoted to Joseph Marx's orchestral works and after the success of the first, which featured some very beautiful symphonic pieces, we now have one devoted to the orchestral song medium. The Bochum Symphony Orchestra are attuned to these overtly romantic pieces and both soloists are also top class interpreters. The eleven Songs for High Voice are delightful short pieces that create a haunting autumnal atmosphere that is full of nostalgic and romantic longing. They are very close to the Richard Strauss idiom especially 'Ständchen' and 'Sommerlied' but the original voice of Marx is also quite evident. Blasi sings with evident feeling for the music and the orchestral accompaniment is beautifully fashioned by Sloane and his Bochum players. The six Songs for Middle Voice also have special features of their own although they are similar in construction to their counterparts for soprano. Stella Dolfexis is an exciting discovery as she brings with her a rich timbre and full tone that match the music perfectly. The song cycle 'Verklartes Jahr' is also very beautiful and deserves to be much better known although it si again superbly done by Sloane and the fine Bochum orchestra with Dolfexis bringing great swathes of power and drive to the final 'Auf der Campagna'. AS&V's recording is excellently balanced although at times, the orchestra does appear to be slightly recessed. Most of the music has rarely been heard though and I do recommend this disc to those who enjoy late romantic composers such as Rott, Raff and Zemlinsky. Marx is definitely a voice that deserves to be much more frequently heard.